I do know this though, eggs are about 25% (maybe up to 50%) larger now so I’d find some small eggs or cut the number of them for the recipes. I have a joy of cooking from the 70’s and when it asks for two eggs I use one or one and a half. Ah, good point about the eggs. When I made the cake, it said to bake it in a “slow” oven. Up here we are elevated enough that I have learned the difference between a “slow” and a “fast” oven. I love the language. “Scant” cup of this or that. It’s awesome. 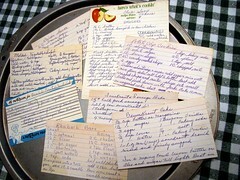 There are at least 8 separate recipes for fudge and angel food cake, and at the back, they included order forms if you wanted more books. Just had to send them $1.25, which I am guessing included the postage to mail it too you. Wonderful! I don’t have any family cookbooks, but I do make similar notations in my own — including a few recipes that I’ve simply drawn a big X across! What I do have with my grandmother’s notes are her piano books: Beethoven sonatas, Chopin etudes, etc., with her notes to slow down or to stretch her fingers (because it’s a big jump between notes on the keyboard), or simply that a piece is hard or lovely … along with the date that she deemed that she had mastered the piece. I don’t play piano, and neither of my boys do, but those volumes are a treasured piece of my family history. My grandmother was about 70 when I was born. She already had a gazillion grandchildren and playing on the floor with us or going shopping wasn’t something she did. Mostly, I can barely remember her speaking at all. She listened a great deal more than she spoke. I think the first time we had a conversation was when I began visiting her every night while I was out for my run when I was at home one summer during college. The home was right on my route. By then she couldn’t speak at all, but we had the best conversations. I would talk and she would gesture, laugh, smile and nod. After she died, I got only one thing – a hand mirror – that had belonged to her. My cousins sorta scooped up the rest. This last summer, however, my Auntie let Dee have Grandma’s red rocker from her childhood (it’s over a hundred years old and in remarkable shape really) and my sister and I were allowed to select any of the serving bowls or plates we wanted. Some were Grandma’s and some belonged to Great-Grandma. Can’t even begin to put an age to any of them. The book was a surprise. Didn’t even know it existed. Sweet treasure.